GAZA CITY, PALESTINIAN TERRITORIES: Israel was under mounting international pressure amid calls Tuesday for an independent probe after its forces killed 60 Palestinians during violence along the Gaza border as the United States opened an embassy in Jerusalem. 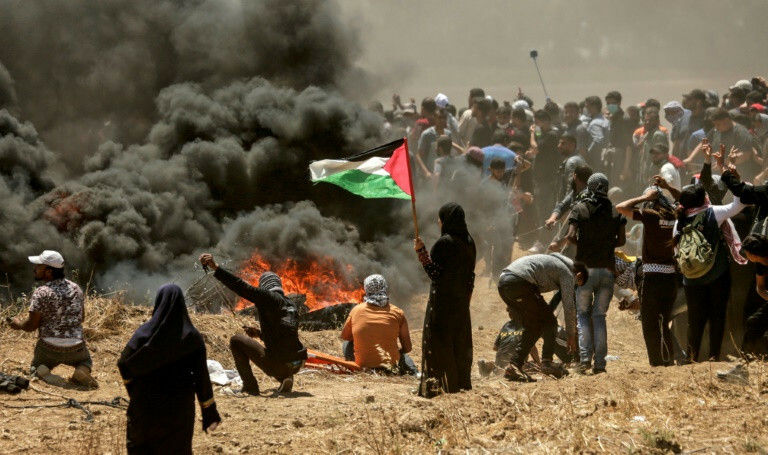 Protests and sporadic clashes flared again on the Gaza border, though they were far fewer in number than the previous day, with one Palestinian killed by Israeli fire, the Gazan health ministry said. Palestinians on Tuesday marked the Nakba, or ‘catastrophe’, commemorating the more than 700,000 Palestinians who fled or were expelled in the 1948 war surrounding Israel’s creation. On Monday, tens of thousands had gathered near the border while smaller numbers of stone-throwing Palestinians approached the fence and sought to break through, with Israeli snipers positioned on the other side. Most of the 60 Gazans killed Monday were shot by Israeli snipers, Gaza’s health ministry said. The toll included a baby who died from tear gas inhalation along with eight children under the age of 16, the ministry said. At least 2,400 others were wounded in the bloodiest day in the Israeli-Palestinian conflict since the 2014 Gaza war. Israel’s army alleged Tuesday that “it appears that at least 24” of those killed were militants, mainly from Hamas. But there were numerous calls for an independent investigation into the deaths, with Britain, Germany, Switzerland and Belgium among those supporting such action. UN Secretary-General Antonio Guterres and the European Union have previously called for an independent probe, with 115 Palestinians killed by Israeli forces since protests and clashes began on the Gaza border on March 30. Only one Israeli soldier has been reported wounded during that time. “The United Kingdom supports an independent investigation into what has happened,” Alistair Burt, British minister for Middle East affairs, told parliament. 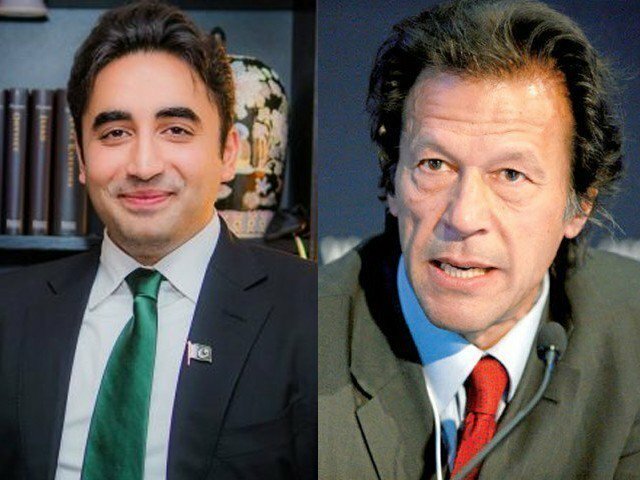 He called for “greater restraint” in the use of live fire, while adding it was “deplorable but real that extremist elements have been exploiting these protests”. French President Emmanuel Macron condemned the “violence of the Israeli armed forces against the protesters”. Ireland and Belgium summoned the Israeli envoys in their capitals, while South Africa recalled its ambassador to Israel. Turkey told Israel’s ambassador to temporarily leave the country, while President Recep Tayyip Erdogan accused Israel of ‘state terror’ and ‘genocide’. That led Israeli Prime Minister Benjamin Netanyahu to hit back on Tuesday. “Erdogan is one of the biggest supporters of Hamas, so there’s no doubt he’s an expert on terror and slaughter,” Netanyahu said in a Hebrew-language Twitter post. The US ambassador to the United Nations strongly defended Israel at an emergency meeting of the UN Security Council on the violence in Gaza. “No country in this chamber would act with more restraint than Israel has,” Nikki Haley said. “In fact the records of several countries here today suggest they would be much less restrained”. On Monday, the United States also blocked the adoption of a Security Council statement that would have called for an independent probe into the violence, diplomats said. 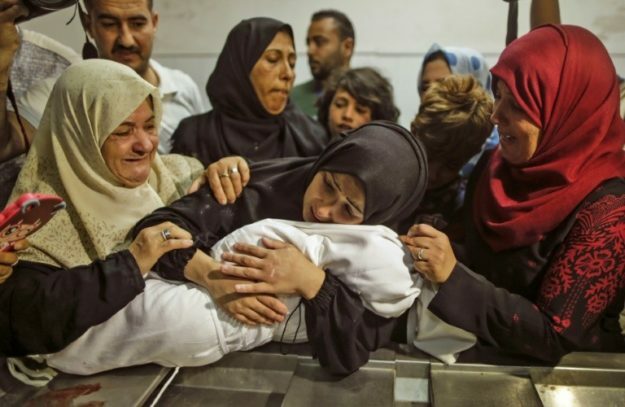 Some funerals were held in Gaza on Monday, while others took place Tuesday. 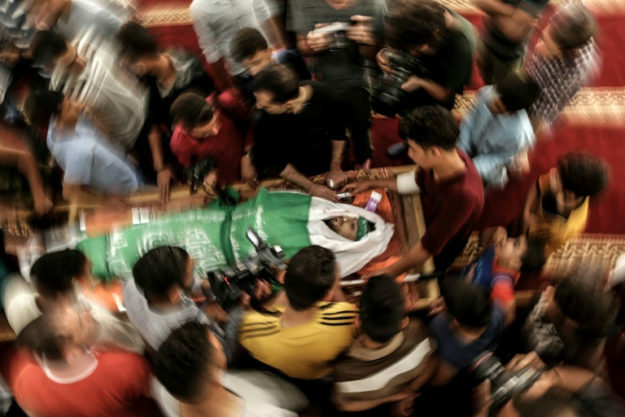 Hundreds attended the funeral of Yazan Tubasi, 23, killed east of Gaza City. “I am happy that my son is a martyr,” said his father Ibrahim, 50, though he was crying uncontrollably. In the West Bank, Palestinian president Mahmud Abbas declared a general strike on Tuesday after accusing Israel of ‘massacres’. Despite the bloodshed, the embassy inauguration on Monday went ahead as planned in Jerusalem, attended by a Washington delegation that included US President Donald Trump’s daughter Ivanka and her husband Jared Kushner, both White House aides. Israel’s military said 40,000 Palestinians had taken part in the protests and clashes the same day. It said its aircraft had targeted 11 Hamas sites and tanks fired at “two terror posts belonging to Hamas”, accusing the movement of opening fire towards Israeli forces. The army said ‘many rioters’ tried to breach the border fence Monday and “approximately 10 explosive devices and several firebombs were used to target the security fence and [Israeli] troops”. It said shots were also fired at soldiers. The embassy inauguration – which took place on the 70th anniversary of Israel’s founding – followed Trump’s December 6 recognition of Jerusalem as Israel’s capital. Israel occupied the West Bank and east Jerusalem in 1967 and later annexed east Jerusalem in a move never recognised by the international community. Jerusalem’s status is perhaps the thorniest issue in the Israeli-Palestinian conflict. Israel considers the entire city its capital, while the Palestinians see east Jerusalem as the capital of their future state. International consensus has been that the city’s status must be negotiated between the two sides, but Trump broke with that to global outrage. He has argued that it helps make peace possible by taking Jerusalem “off the table”, but many have noted he has not announced any concessions in return from Israel.